Composed by Andrew Lloyd Webber and Tim Rice. Vocal Selections. 80 pages. Published by Hal Leonard (HL.120077). The songbook for this movie musical spectacular features 12 beautiful Andrew Lloyd Webber/Tim Rice songs. Includes the Oscar-winning single “You Must Love Me” and the mega-hit “Don't Cry for Me Argentina,” plus: Another Suitcase in Another Hall • I'd Be Surprisingly Good for You • On This Night of a Thousand Stars • She Is a Diamond • Waltz for Eva and Che • and more. I must say this book is great, but it is a little too easy for me. I wish they would sell the VOCAL SCORE to EVITA. Although this book is easy, its a joy to play out of. Believe me, this book isn't a disappointment. 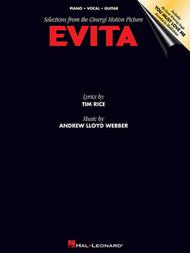 The songbook from the Movie Evita includes many of the most popular songs. Most are not difficult arrangements and have provided me with many hours of playing pleasure.